I usually tell people I literally stumbled into PR but, the truth is, I think fate played a much bigger role than I let on. I always loved writing and storytelling in grade school and had a penchant for being heavily involved with student government. After becoming my residence hall’s president my sophomore year, I got involved with MSU’s campus wide Residence Halls Association executive board. 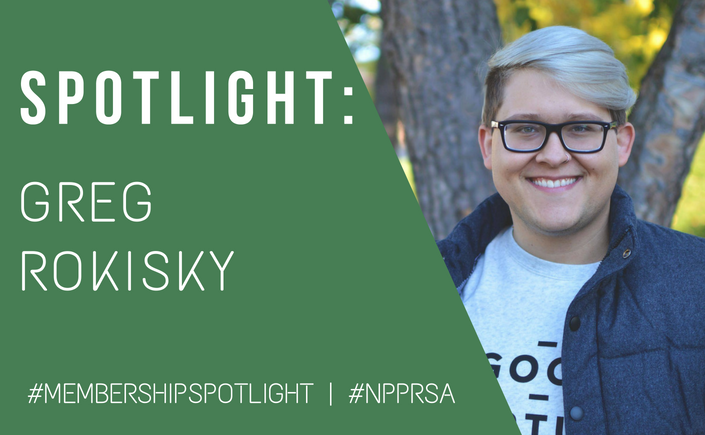 I wound up the Director of PR and, shortly after, I landed my first official PR internship. The rest started to fall into place from there. My curiosity is simultaneously my biggest strength and weakness. I always look for things that interest me in places that might not be where others are looking. I worked for the on-campus food service chain at MSU, Sparty’s. After doing my time frying chicken tenders and flipping burgers in one of the sites within the residence halls, I applied for an HR role that eventually transformed into a communications role. When it came to most of my jobs, they came about based on where I wanted to grow my skills—one was at the company I was interning, the next a full-time opportunity working remotely and my current role as a manager to broaden my traditional marketing and nonprofit experience. Be curious…you never know the answer if you don’t look around and ask questions. It’s one I’m still facing—I have unrealistic expectations to produce perfect results every time, both from myself and others. Perfect rarely happens. Sometimes, you won’t be even 60% happy with your work but it’s what you can do given deadlines, resources, time, etc. I just remind myself that sometimes I’ll outperform what I expected and others I’ll underperform and hopefully, in the end, they all balance each other out. It reminds me of a new book I just started, where the author suggests we stop trying to be well-balanced and, instead try to be well-lopsided people. The most valuable things I’ve learned in life, professionally and personally, have come through doing. Therefore, it’s all about saying yes to as much as you can lopsidedly balance and put yourself in slightly uncomfortable positions throughout life…probably forever. I’m a huge proponent of learning and believe education, however you choose to define it, should be a lifelong process. Relationships, sincere relationships, truly matter—and not only if you’re in PR. Being in PR certainly helps nail down the importance of relationships, but I can’t even count how many times my relationships have led to something. My freelance work has all come from relationships I’ve built. My PRSA involvement, locally and nationally, have come from my relationships. Jobs and recommendations have come from relationships. Some of the best memories, laughs, professional conversations have been had because of the time I’ve put into my relationships. Jobs don’t get us through tough times, people do; we should spend more time appreciating our relationships (makes note to self). Everything is becoming more and more integrated and data-heavy. Don’t be afraid of Excel. Seriously…math and data are your friend. It goes back to the relationships, in part, and also the opportunity to get your name out there. Not many industries can you begin your career and be able to join a group that allows you to contribute your insight to a national blog (insert shameless plug to write for PRSA New Pros blog, The Edge). That, paired with the opportunity to enjoy catered professional development and networking with other new professionals in your field going through similar struggles, wins, losses and the like is priceless in my book. That oftentimes trying to be what you think professional success should look and act like proves to be way less valuable and effective than embracing the magic of who you actually are. My favorite existing animal are penguins; my favorite non-existing animal is a unicorn (although they exist in my heart). Despite having neither as a pet, I do love my dog Fitzgerald—named simultaneously after F. Scott Fitzgerald and President Fitzgerald Grant III from Scandal.